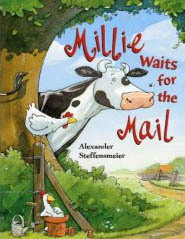 The wonderful silliness of this book (How on earth did Alexander Steffensmeier think of writing a book about a cow scaring the mail carrier?) is especially evident in the illustrations. The look in Millie's eye as she scours the farmyard for hiding places is priceless. The page where Millie first jumps out and scares the mail carrier got a big reaction from the kids every time I showed it to them. A big reaction from the adults in the room, too. What can I say? This book makes me laugh every time I look at it. It doesn't promote good, noble purposes. But it is absolutely, delightfully, wonderfully Silly.